Good writers and editors strive to produce content that their audiences can consume easily. But when the core writing and editing is done, those writers and editors (or designers they work with) sometimes put that well-written, well-edited content into a form or style that readers cannot consume easily. One of the biggest offenders: reverse type—light text on a dark background. You’ve seen it. You’ve seen it everywhere. It’s white on black. It’s white on blue. It’s beige on dark brown. It’s on the label of a Jack Daniel’s bottle. It’s in the Facebook logo. It’s on movie posters for the “Twilight” series. It’s on signs and book covers and business cards and marketing mailers everywhere you turn. And that’s where it should stay—in “short-read” media such as logos and in other at-a-glance forms of content. Reverse type works appropriately as an attention-getting tool for quick-read text elements—short blasts of content that don’t require the reader’s eyes to do much work. In a longer form, however, reverse type proves difficult for many people to read. It doesn’t belong in the body of a think piece, a long-form feature article, a news article, or in a blog post of more than, say, 100 words. Reverse type simply makes the reader work harder than he needs to work to get through what you’ve written. And when a reader has to work too hard, you’re likely to lose that reader. Reverse type wearies the eyes—especially when written in a serifed font (with serifs tending to bleed and blur into the darkness of the background) and especially when the eyes reading the text aren’t perfect eyes. Be aware that the writer’s eyes and the designer’s eyes might be far sharper than the eyes of an average reader. 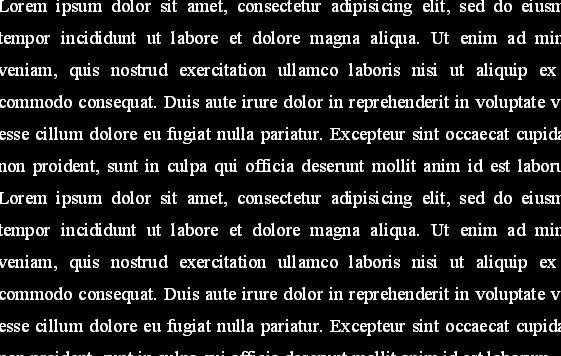 For the writer or designer, reading reverse type in long pieces might not present much of a challenge. But—ageist though it might sound—many readers over the age of 40 (readers whose eye doctors already have uttered the word “bifocals” to them more than once) can find reverse type laborious to read. So try to keep your least-common-denominator reader in mind. Avoid reverse type for long pieces. Even the brightest writers and organizations let reverse type creep in where it does not belong. A mobile app for the Associated Press, for example, has served up lengthy news articles in reverse type—in whitish text on a black background. And the mega-novelist George R.R. Martin also blogs in reverse type, although he has the luxury of an ardent fan base that will slog gladly through reverse type to read what he has to say. Less prolific writers, however, should stick to regular type—dark letters on a light background—if they don’t want to lose their readers. Thank you for this post. While I love the look of reverse type, reading more than a few lines becomes challenging, especially when the font is fancy or the point size is small. And yes, I’m of that bifocal age!